... Fortunately, our present field of survey is only a narrow sliver in the suggested panorama, being confined to the English literary world mainly of the third quarter of the eighteenth century—to that " 'batable Land" known variously as "post-Augustan," "pre-Romantic," or whatever the particular ax may be sharpening toward: the "Age of Johnson," the Antiquarian Decades, the Heyday of Amateur Scholarship and of the pre-episcopal Percy. The story of the publication of the Percy Letters is much too long to be told in a blog post. But I'll give you the short version, concentrating primarily on the publication of the first volume. I will tell you, however, that Samuel Johnson is mentioned in 167 topics of conversation in the nine volumes, including 35 times in the first volume alone. Although the Percy Letters themselves were written over 200 years ago, the first volume of the series, The Correspondence of Thomas Percy & Edmond Malone, wasn't published until 1944. And the last volume, The Correspondence of Thomas Percy & Robert Anderson, wasn't published until 1988. 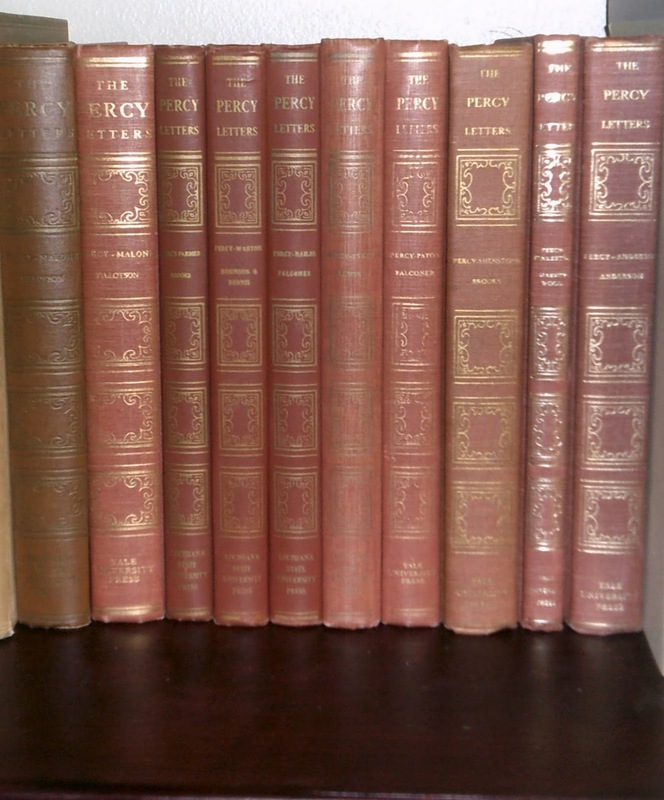 I have the late Gabriel Austin to thank for receiving most of the volumes of my set of The Percy Letters. After Mary Hyde Eccles passed away in August 2003, her Samuel Johnson Collection went to Harvard, her Oscar Wilde Collection went to the British Library, and her Shakespeare Collection went to Christie's, the auction proceeds of which benefited other libraries and Hyde charities. Most of "the leftovers" from the Four Oaks Library went to her friend and librarian, Gabriel Austin. Now Gabriel wasn't a book collector, so he sold some of the books, and gave others to some of his friends. Included in the books he gave me was an incomplete set of The Percy Letters, lacking only the volumes of Thomas Percy's correspondence with John Pinkerton and William Shenstone. I acquired a copy of the Pinkerton volume about five years ago, and just last month, I purchased a copy of the Shenstone volume from a member of the PBFA in England—and at a very reasonable price! I mentioned before that there are nine volumes in the series of The Percy Letters. My set, however, contains ten volumes because the first volume was reprinted in 1960 (more on the reprint later). I have the general editors, Cleanth Brooks (1906-1994) and David Nichol Smith (1875-1962), to thank for the publication of The Percy Letters. And although the first volume was published in 1944, both the Cleanth Brooks Papers at Yale University Library and the Collection of the Correspondence of David Nichol Smith at the Bodleian Library reveal that Brooks and Smith began corresponding specifically about the Percy Letters in 1932. Brooks, a Rhodes Scholar, took a Litt B course at Oxford in 1932, and David Nichol Smith, the Merton Professor of English Literature, taught the course. Later that same year, Brooks accepted a teaching position at Louisiana State University, whose Press would be the publisher of the first five volumes of The Percy Letters. But Cleanth (pronounced cl-ean-th) Brooks and D. Nichol Smith had their "day jobs" and other literary activities to attend to, and their plans to publish the Percy Letters were delayed. Nevertheless, with letters going back and forth across the ocean, they determined the location of most of the Percy Letters, and they selected the first few editors for the series. In 1935, David Nichol Smith began corresponding with the individual editors. Included in the Smith collection at the Bodleian are Smith's letters to Arthur Tillotson (1908-2000), Superintendent of the Reading Room, Cambridge University Library, and the individual selected to be the editor of the first volume of the series, The Correspondence of Thomas Percy & Edmond Malone. Cleanth Brooks began corresponding with Arthur Tillotson in 1939. But when Hitler invaded Poland in September, Great Britain declared war on Germany. 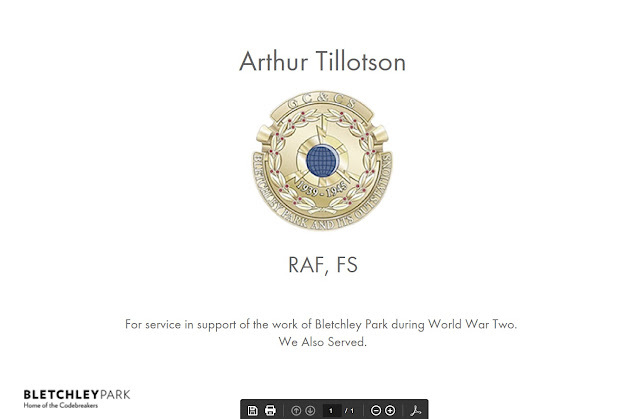 And Brooks soon learned that Arthur Tillotson was rather busy in the RAF. Kathryn James, Curator for Early Modern Books and Manuscripts & the Osborn Collection at the Beneicke Rare Book and Manuscript Library, Yale University, provides vital bits of information in the timeline of events which further delayed the publication of the Percy/Malone Correspondence. In an article published in the Journal of the Rutgers University Libraries in 2012, Kathryn James brings James Osborn, the Malone scholar, into the picture. If the name sounds familiar, Osborn was a prime player in my March 2016 blog post, The Story of Spence's Anecdotes. In her article, Kathryn James reveals that Arthur Tillotson had written Osborn in August 1939, promising to send him proofs of the Percy/Malone Correspondence for Osborn to review—a promise he never kept. Osborn queried Brooks about Tillotson's progress in March 1940. Tillotson sent the proofs directly to Brooks albeit almost two years later. And Brooks sent them to Osborn in February 1942. Osborn, however, was busy with the war effort himself. Moreover, Osborn was displeased with Tillotson's editing. Meanwhile, Louisiana State University Press was screaming for the book to be published, so in November 1942, Brooks politely asked Osborn to return the proofs. I should mention that Brooks and Osborn remained on good terms. In fact, Osborn was responsible for Brooks relocating from LSU to Yale in 1947. And in a letter to his friend, Robert Penn Warren, the following month, Brooks reported that he had to compile the index to the Percy/Malone Correspondence himself before the work went to press because Arthur Tillotson was still busy in the RAF. Cleanth Brooks edited the second volume of The Percy Letters himself: The Correspondence of Thomas Percy & Richard Farmer, which was published in 1946. Brooks would also edit the seventh volume, the Shenstone volume, in 1977. David Nichol Smith did not live to see the publication of the entire series of The Percy Letters; he died in 1962. Brooks and Smith were the general editors of the first five volumes. A. F. Falconer, (1908-1987) the special editor of the sixth volume, the George Paton volume, published in 1961, replaced Smith as one of the two general editors for the last three volumes. Cleanth Brooks was the only one of the general editors to see the entire series of The Percy Letters in print. Here is a list of the nine volumes, and with bibliographical information provided. Volumes six through nine were published by Yale University Press. 1. The Correspondence of Thomas Percy & Edmond Malone, edited by Arthur Tillotson, [Baton Rouge]: Louisiana State University Press, 1944. 2. The Correspondence of Thomas Percy & Richard Farmer, edited by Cleanth Brooks, [Baton Rouge]: Louisiana State University Press, 1946. 4. The Correspondence of Thomas Percy & David Dalrymple, Lord Hailes, edited by A. F. Falconer, [Baton Rouge]: Louisiana State University Press, 1954. 5. The Correspondence of Thomas Percy & Evan Evans, edited by Aneirin Lewis, [Baton Rouge]: Louisiana State University Press, 1957. 6. The Correspondence of Thomas Percy & George Paton, edited by A. F. Falconer, New Haven: Yale University Press, 1961. 8. The Correspondence of Thomas Percy & John Pinkerton, edited by Harriet Harvey Wood, New Haven and London: Yale University Press, . 9. The Correspondence of Thomas Percy & Robert Anderson, edited by W. E. K. Anderson, New Haven and London: Yale University Press, . Yale University Press reprinted the first volume in 1960, adding an appendix containing the four letters, and including an Addenda et Corrigenda to the Introduction which listed 17 errors found in the first printing. I do wonder if Donald and Mary Hyde had anything to do with convincing Cleanth Brooks and Yale University Press to reprint the Percy/Malone volume. Surprisingly, as of May 1st, 2016, there is no mention of Cleanth Brooks's contributions as editor of The Percy Letters in his biographical entry on Britannica.Com, an article written by the editors of the Encyclopædia Britannica. And although David Nichol Smith's correspondence relating to the Percy Letters is mentioned in the Archives section of his DNB listing, there is no specific mention of his contributions as editor of The Percy Letters in the biographical entry proper—at least not in the October 2004 DNB entry that I was able to access online on May 1st, 2016. The scholars recognized and reviewed the individual volumes of the Percy Correspondence after each volume was published. One scholar, Bertrand H. Bronson, wrote a brilliant article about the first five volumes of the Percy Correspondence which appeared in the Sewanee Review in 1959. And then Bronson updated the article, "A Sense of the Past" for his 1968 book, Facets of Enlightenment, to include the sixth volume as well. 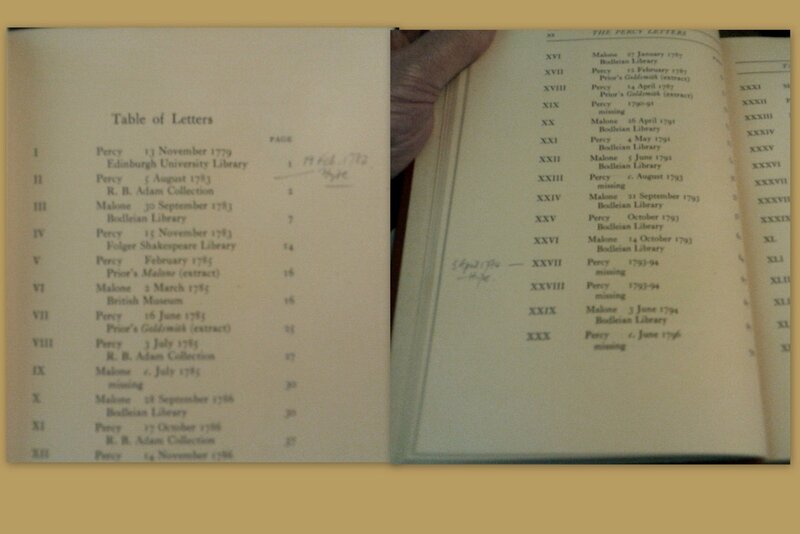 I have not found a scholarly article or a book that covers all nine volumes of The Percy Letters. Surely, such an article has already been written. But I have my doubts whether such a book has been written—at least I haven't found one. I do wonder, among other things, why it took Cleanth Brooks fifteen years after the death of David Nichol Smith in 1962 to resume the publication of The Percy Letters. Perhaps someone will answer that question in the book that has yet to be written. Manuscript Library. Web. 1 May 2016. Correspondence of David Nichol Smith. MSS. Eng. Lett. C. 489-92. Bodleian Library. the Rutgers University Libraries. Rutgers University. Vol 65 (2012). Web. 1 May 2016. Vinh, Alphonse, Cleanth Brooks and Allen Tate: Collected Letters 1933-1976. Columbia and London: University of Missouri Press, 1998. Google Book Search. Book Search. Web. 1 May 2016. Bronson, Bertrand H. “A Sense of the Past”.The Sewanee Review 67.1 (1959): 145–155. Contexts. Berkeley and Los Angeles: University of California Press, 1968.